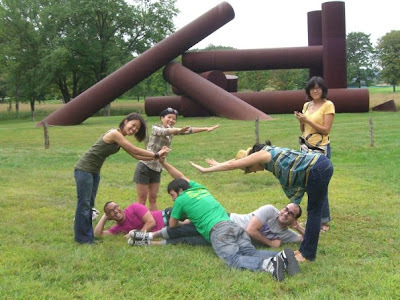 A bunch of us headed to Storm King on Labor Day for some interactive fun. It was one of Jason's to-do's before he leaves NYC. I've been meaning to go for a couple years now as well. It's only an hour away from the city yet it feels like you're in a different country. It reminded me a bit of Europe. Seeing the sculptures reminded me very much of my 3D classes from first year. Looking at things from all sides, proportion, curves, angles, is it dynamic? Here are some of the many sculptures and some shots of us interacting with a few pieces. Little did we know only two of them were supposed to be interactive. Oops. Anyone catch this artist's name? Not the greatest shot but I really dig this sculpture. What do you see? So much open space just an hour from NY.